The Aleppo pine (Pinus halepensis) can enhance your landscape if you live in a hot, dry location and have a spacious yard. This Mediterranean native is an evergreen conifer that has adapted to growing in warm, dry conditions. The tree is sometimes sold for use as a living Christmas tree. This tree grows in USDA plant hardiness zones 8 through 10. It is related to fir trees, spruce trees, cedars, hemlocks, and the larches, which are deciduous conifers. 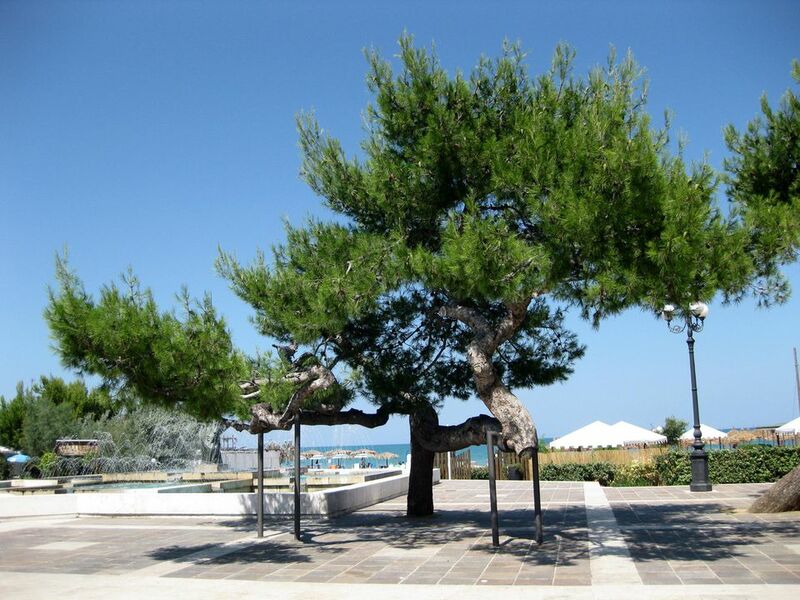 The tree's common name, Aleppo pine, comes from the city of the same name in Syria. Another name for this tree is Jerusalem pine. When the tree reaches full size, it is anywhere from 30 to 80 feet tall with a similar spread, with the ultimate size depending on the growing conditions. It grows in an irregular shape. Unless you have a spacious yard, this tree may potentially become too large and overpower the area. It serves well in parks and commercial plantings. Choose a planting site where the tree receives full sun throughout the day. Because it grows into a tall tree, it shades the areas below it. Choose plants for the surrounding area that tolerate some shade. The tree grows rapidly and requires a lot of space. Each leaf bundle—fascicle—contains two or sometimes three needles. Each thin needle is 2 to 4 inches long. As with other pine trees, the Aleppo pine is monoecious, with both male and female flowers on each tree. The cones are 2 to 5 inches long and oblong, round or egg-shaped. When they first form, they are green. Eventually, they turn brown as they age. The seeds are spread to new areas by wind after the cones mature and open. In the U.S., the Aleppo is a popular ornamental tree in hot, dry areas. The Aleppo's tolerance for heat and drought and its fast growth are highly valued in these areas. In its native Mediterranean area, it is planted for its lumber, which is hard and dense. The Aleppo pine is able to resist drought, though the needles sometimes turn yellow or drop off. It does best if it receives a few waterings a month, especially during the first year to help the roots grow properly and create a strong structure that can find water in times of need. When the Aleppo pine is purchased as a living Christmas tree, choose a location and dig the hole ahead of time so it is ready when the season is over. Move the tree in and out of the house over a period of time to harden it off and prevent shock before planting it outdoors. If you don't have enough room in your yard, arrange ahead of time to donate it to a local park. This tree can handle a wide range of soil pH levels from acidic to alkaline. It can also grow in soils that are clay, loam or soil, as long as it drains well. The Aleppo pine tree does not require pruning unless you are taking out a wayward branch or removing parts that are dead, diseased, or damaged. You can control growth and shape to some degree by removing the conifer candles—new growth—when they first appear. Propagation is usually carried out through seed germination. You can take cuttings from the tree in its early years, though they can be slow to take root and grow.